One hundred and thirty-three readers love this post. Recipe and photo by Chuck Fowler and Chef Bailee Warrell. 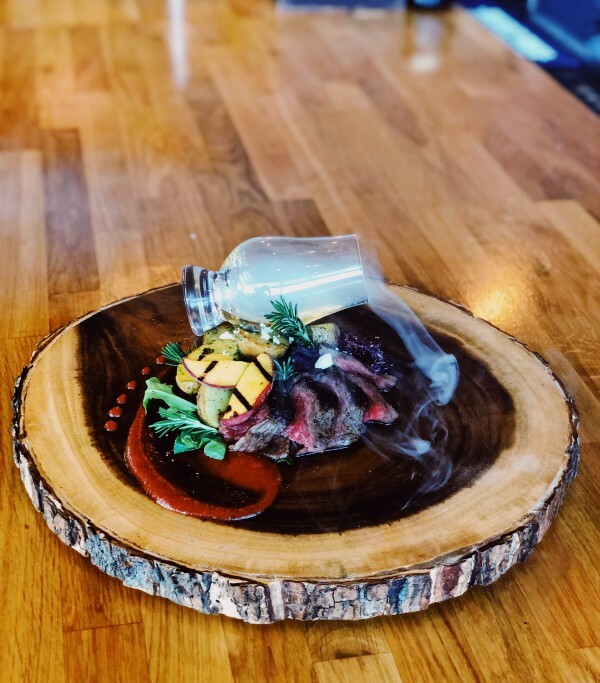 Pictured: Scotchdale infused peach-honey rosemary steak with organic arugula, currants, and goat cheese on top of lightly fried baby potato medley with chimichiri sauce and toasted peach slices. Smoked scotch to compliment the dish. Peel and cut up 3 medium peaches, place in a blender. Add lemon juice, honey and cracked black pepper. Cover and blend to a smooth texture. Place in a medium sauce pan. Add 2 oz of Scotchdale, bring sauce to a boil and then reduce heat. Simmer, uncovered, for about 15 minutes or until slightly thickened, stirring occasionally. Remove from heat. Peel and finely chop 1 medium peach; stir into sauce. Stir in chopped thyme. Smother sauce onto steak while grilling. Add to top of steak for extra flavor, enjoy. Arugula, Rosemary, Currants, Goat Cheese and chimichiri sauce. Lifestyle, fashion and food blogger based in Las Vegas!